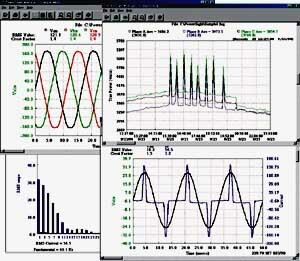 Summit Technology, Inc. offers the PowerSight Manager (PSM) analysis software for Windows 95/98/NT. This product allows full graphical analysis of three-phase, single-phase, phase-phase, phase-neutral, AC/DC, and 45 to 440 Hz power. When connected to Summit Technology, Inc.'s energy analyzer, the unit can obtain real-time and stored waveforms of seven channels of power inputs. These waveforms can be graphed individually or in combination, and complete harmonic analysis with bar charts or raw data can be obtained. Any display can be printed in full color. Data logs can be downloaded and displayed for analysis, and zoom and labeling functions allow precise analysis and display of the data of interest. Data log displays contain 60 different measurement types including voltage, current, true power, apparent power, VAR, power factor, energy, frequency, and harmonic distortion of each phase. For custom analysis, all log data stored by PSM is accessible as text files that are directly compatible with Excel and other spreadsheet programs. An integrated knowledge system is incorporated to provide basic information about power analysis including definitions of all measurement terms and concepts, proper hookups to measure various power systems, and tutorials. The user can select between American, Spanish, French, German, British and Italian languages.